Unique safety action, featured, lifts the bottom step preventing access to the steps until the unit is grounded and safe to use. Highly manoeuvrable and robust design gives maximum rigidity and stability. Large working platform, W x D: 540 x 590mm. Tread W x D: 490 x 128mm. Finish - powder coated high gloss blue. * Supplied partially in ‘knock-down' form for safe transportation. Ensuring your employees are as safe as possible while working is essential, especially when they work at height, so the correct equipment for the job is vital. 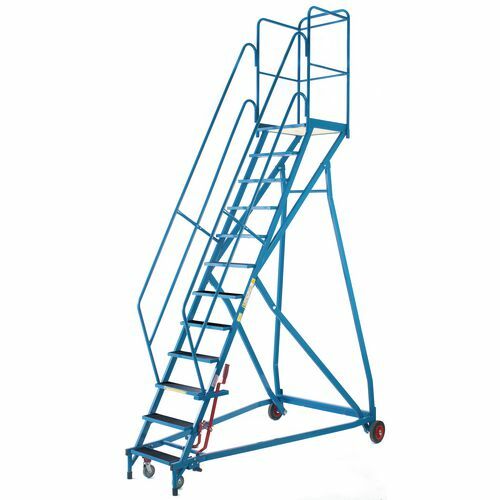 Our heavy duty mobile safety platform steps are an ideal addition to assist employees' working at height. These steps have a unique safety action, it lifts the bottom step preventing access to the steps until the unit is grounded and safe to use, helping to prevent accidents. They are highly manoeuvrable and they have a robust design which provides maximum rigidity, creating more stability for the user. Manufactured and approved to stringent GS and EN131 part 7 standards, you can be confident that this product is constructed to a high quality. The large working platform offers a great surface area for the user to work from, making it easier for them to concentrate on their tasks and complete them efficiently. There are 13 platform heights to choose from; 690, 920, 1150, 1380, 1610, 1840, 2070, 2300, 2530, 2760, 2990, 3220 or 3450mm. There is also a choice of three tread materials; aluminium, rubber or steel. Our heavy duty mobile safety platform steps are an easy and safe solution for working at height and they come with FREE UK Delivery.